As I mentioned you recently, the happenings in my kitchen look a little different than what I’m used to this holiday season. I’ve been writing about food for nearly 10 years, but this year, those foods no longer include gluten, dairy, eggs, or a smattering of other scrumptious things that have frequented my table in years past. For those with special diets, this time of year can be a major challenge. In fact, historically some of my most favorite holiday treats were those heavy on the wheat and dairy, and those things are no longer allowed. So what’s a girl to do when those ingredients are stripped from her kitchen? Get creative, of course! The holidays are always a joyous time for so many reasons, one of the greatest of which is food. But whether you can eat anything that graces your table, or you have to be extra careful about what passes your lips, you should find things that make you feel good – mind, body, and spirit – this time of year. That’s been my approach, anyway, and it can help to make the limitations feel slightly less limiting. These coconut macaroons are a delightful and delicious, allergy-friendly alternative to a popular favorite. They only include 5 ingredients, and are super simple to make. And the best news of all? Everyone will enjoy them! Here I’ve served them on the gorgeous Sakuya Lace plate, one of my all-time favorite 222 Fifth patterns. While maybe not an obvious holiday pattern, with the right additional touches, it looks just lovely. The Sakuya pattern is mildly reminiscent of snowflakes, and the soft blue color of a snowy countryside. Sometimes I find that a calmer, cooler palette offers a refreshing change from all of the popular reds and greens of this time of year. Looking for some new dinnerware to serve your own cookies on?! 222 Fifth has generously offered 25% off any item to Sweetly Serendipity readers using the code “SWEETLY” at checkout. They have some beautiful patterns both for the holidays, and beyond. Check them out! Preheat oven to 350 degrees F and lightly grease a baking sheet, or line it with parchment paper. Add coconut to a food processor and process on high, pausing to scrape down the sides as necessary. You’re trying to achieve a texture not quite like coconut butter, but close enough that the coconut starts to have a dough-like texture when you squeeze it together. If your mixture gets too close to coconut butter, add in a bit more shredded coconut and you should be all set. Add the maple syrup and vanilla, and continue mixing until incorporated. Using a small cookie scoop (about 1.5 tablespoons) or a tablespoon, portion out coconut dough, and pack firmly into scoop or tablespoon to achieve an even shape. I used a tablespoon and packed the dough into it, then gave it a gentle tap on the baking sheet and each macaroon loosened easily. Repeat with remaining coconut dough until all of the coconut has been used. Brush the tops of each macaroon with the melted coconut oil, and bake for 8-10 minutes, until the edges of the macaroons are golden brown. Let the macaroons cool completely before dipping in chocolate. When ready to dip, melt chocolate in a double boiler, or in 30 second increments in the microwave. 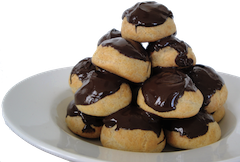 Gently pick up each cooled macaroon, and dip the bottom into the melted chocolate. The macaroons may be fragile, so be careful with this step. Lay chocolate-dipped macaroons on a fresh sheet of parchment or wax paper, and continue dipping the rest. If you have chocolate leftover, or melted extra to drizzle over the top, I find it’s easiest to put your remaining chocolate into a plastic baggie and snip off the corner, so you get an even stream of chocolate for decorating. Then, let set, and serve!